There are new technologies that are empowering residents and property managers. One company is even trying to help make noisy neighbors a thing of the past. When faced with a complaint for a noise violation, property managers usually inform the resident politely of an alleged violation, without identifying the claimant. If the noise persists, the common next step would be to issue a Kapa (lease pre-termination) notice which gives the tenant 30 days to remedy the problem or else there is risk of being kicked out. Another course of action for a property managers to take is to ask the resident to “call the police.” This type of behavior is not only damaging for the relationship between neighbors, but also between the resident and property manager. Effectively, the burden of responsibility shifts from the property manager, to a publicly paid law enforcement officer. The police often just knock on the door noisy neighbor’s door and ask the neighbor to “Please quiet down.” There could be several reasons for involving the police from the tenant perspective. You might be thinking, “Why not just knock on the door yourself.” Perhaps the resident does not feel safe when approaching a neighbor, in which case there is a deeper problem at hand. The resident could also be concerned about his or her privacy and thinks that knocking will only perpetuate the problem. A resident should feel safe and secure in their own home, and a good property manager is able to foster that kind of environment. 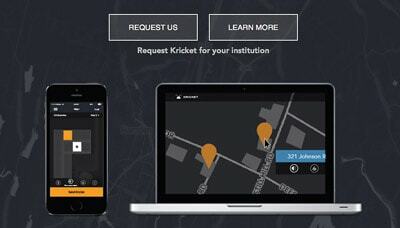 A new service called Kricket is changing dynamic of the noisy neighbor. Kricket is a service that allows residents of apartment complex buildings to send a standardized text message to their neighbor that says “Please quiet down” and “Thank you.” The messages are sent from a specified Kricket phone number, so the sender of the message remains anonymous to the recipient. To the property managers, the messages are not anonymous. They have access to what is called Noise-alyticsTM, a heat map for noise. With Noise-alyticsTM, property managers have access to a live feed of the residents’ activity on a room, floor. and building basis. There are Kricket sending limits to avoid abuse of the service, and no messages can be edited in any way. If residents continue having problems, they can simply notify their property manager of a continued issue with another resident. Kricket is one of several companies emerging into the property manager space. While Kricket targets noise issues, other services like UnBreak are focusing on digital work reporting, maintenance integration, and direct-texting notification systems. The digital landscape is shifting. In a few years, don’t be surprised to see these digital amenities be at the forefront of apartment welcome packages. These startups are giving apartment complexes a valuable tenant service, but also giving managers a huge competitive advantage over apartments that are stuck in the 90’s.